First off I’d like to say congratulations to the final three. I thought they all did exceptional work. 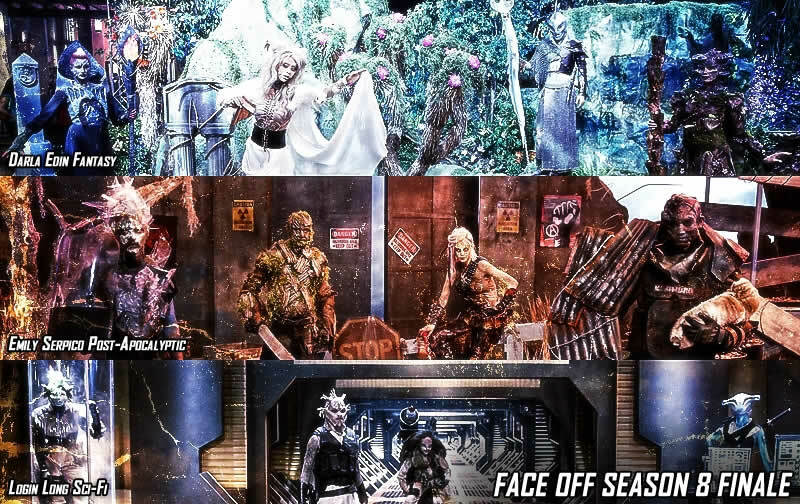 That being said, I think the Face Off season 8 finale was a little unfair. I don’t think it was designed to be unfair. However, from the very moment they made “fantasy” an option I new whoever ended up with “fantasy” was going to win unless they just did an extremely horrible makeup. As I sat and watched, I actually said Darla Edin is going to win as soon as she chose “fantasy”. There was no doubt in my mind. Of the three options, post-apocalyptic, sci-fi and fantasy, fantasy is going to be beautiful. Most people are naturally drawn to beauty. The artists tasked with “post-apocalyptic” and “sci-fi” would have to create extraordinary makeups to even have a chance of winning against even a moderately successful beauty makeup. Darla’s make up was outstanding, I am not saying that it was not. I am just saying it could have been just an average beauty makeup and she would have won against very strong post-apocalyptic and sci-fi makeups. This made the odds stacked against Emily Serpico and Logan Long. Even a little more so against Logan because Emily and Linda have knocked it out of the park with their stunningly beautiful makeups this season. The chances were strong that one of them were going to end up with the “fantasy” category because they were two of them and only one of him. Sure Logan and Emily could have tried to make their makeups more “beautiful” but they took the challenge to heart and made excellent makeups that represented their category perfectly. Darla’s makeups were beautiful and they were very well done. Time and time again when one of the artists has the option to create a beauty makeup they end up winning. I am not really sure what can be done to avoid this kind of situation. Maybe, for future finales the challenge should be more of a level playing field. I would like to have seen what each finalist did with the same category. Instead of each one getting a different category they could have all done the same one. When they are all doing different categories it becomes comparing apples to oranges and simply not an effective way to determine the best makeup and creative design. I realize that life isn’t fair, I get that. I just felt in this case, the outcome was inevitable and thus a little unfair. Darla’s makeups were beautiful and they were very well done. However, because she ended up with the fantasy as her category it gave her an unfair advantage. One, she does beauty type makeups well. Two, “fantasy” usually calls for beauty type make ups. There was almost no way she wasn’t going to win the Face Off season 8 finale. I think Emily Serpico was the most consistent all season long and her final makeups were amazing and every bit as well done as Darla Edin. Logan Long’s makeups for the finale were also very well done. My only criticism was that it had too much of a Guardians of the Galaxy vibe to it. I thought they were great and fun and even though they were completely original makeups, they just came off as having been done before, in my opinion. I probably would have gone with Emily for the win in Face Off season 8 finale. Nothing about what she did was predictable in her post-apocalyptic makeups. And, I think of the three finalists she was the most consistent from week to week. I am convinced that it’s just a matter or time before she is onstage accepting an Academy Award for work. In closing, I really don’t mean to take anything away from Darla’s win. It was original, very well thought out and as I have said, beautiful. The fact that I felt the category was a little unfair to the others doesn’t mean she didn’t deserve to win. It is what is and she definitely nailed her specific challenge. Not to mention her creepy doll was one of the best makeups that has ever been on the show.